DENVER (AP) The Denver Nuggets followed their worst offensive performance of the season with one that will certainly be hard to top. Jamal Murray scored 31 points and the Nuggets had the NBA’s highest-scoring game of the season in a 146-114 victory over the New Orleans Pelicans on Friday night. Denver surpassed the 142 points Houston scored against Phoenix just one night earlier for the highest total in the league this season. It was also Denver’s most points in a regulation game since it had 168 in a win over the Seattle SuperSonics in March of 2008. ”If we’re moving the ball like that and everybody touches it – and we’re cutting, moving and finding the open guy and making shots – we could do that every night,” said Murray, whose team looked far different from its 99-82 loss to Portland on Monday. Nikola Jokic added 13 points and 11 rebounds for his eighth double-double of the season as the Nuggets improved to 7-2 at the Pepsi Center. Gary Harris had 22 points in his return after a two-game absence with right shoulder soreness. Anthony Davis had 17 points and five rebounds for New Orleans before he left the game with a concussion in the opening minute of the third quarter. Davis was inadvertently hit in the face by Jokic’s head as the Nuggets center was backing him down with the ball. 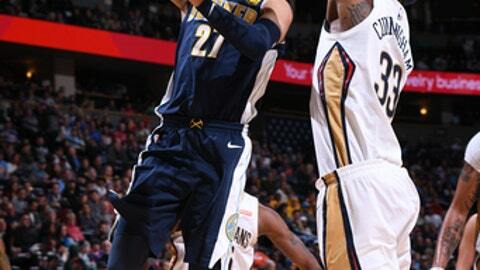 New Orleans coach Alvin Gentry couldn’t provide any details of Davis’ injury after the game. The Pelicans trailed by as many as 27 points in the opening quarter but pulled within 66-58 on Davis’ jumper seconds before he went down with the injury. The Nuggets took advantage of the Pelicans without their All-Star big man and outscored them 40-22 the rest of the way in the third. Emmanuel Mudiay’s 3-pointer before the buzzer made it 106-80. Denver hit nine consecutive shots to jump out to a 25-4 lead. Three of its starters were in double figures by the end of the quarter: Murray had 11 points while Harris and Paul Millsap each had 10. The Pelicans answered, outscoring Denver 48-29 in the final 14:19 of the half. Rajon Rondo raced the length of the court for a layup at the buzzer to pull New Orleans within eight. Pelicans: Cousins had 14 points, while Rondo and G Jrue Holiday each had 13. Moore had 16 off the bench. … Rondo made his second consecutive start of the season after returning from surgery to repair a core muscle injury earlier in the week. … G Tony Allen missed his fourth straight game with soreness in his left knee. Nuggets: C Mason Plumlee (core strain) was cleared to play after undergoing an MRI earlier in the day. … Millsap had 20 points and Mudiay had 19. … Denver Broncos linebackers Von Miller and Brandon Marshall sat courtside. Gentry was candid about his team’s performance after the game. Eight players hit at least one 3 as the Nuggets finished 18 of 35 from outside the arc. ”If you have a shot, shoot it. If you got a pass, make that pass,” Denver coach Michael Malone said. ”When we’re moving the ball like that, we’re generating shots. Now the challenge is to make shots and we made 18 out of 35 3s. Pelicans: Host the Oklahoma City Thunder on Monday. Nuggets: Begin a three-game road trip Sunday against the Los Angeles Lakers.